Finally I was able to figure out what was wrong with my tablet (bad pen). I got the new pen today and celebrated by drawing two new cartoons. 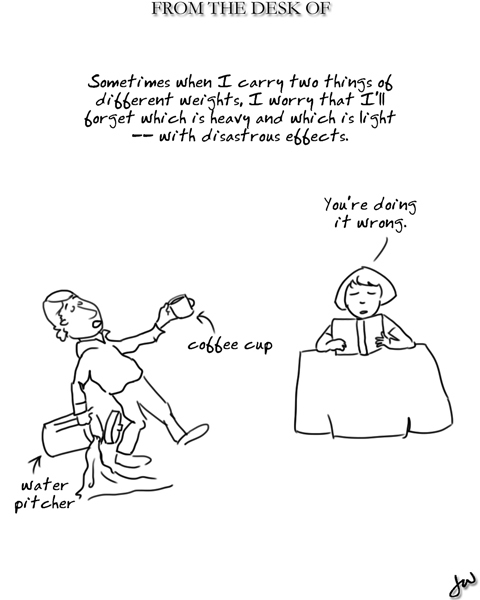 First, I drew a “real” version of the sketch below about carrying light and heavy things together. Here ya go. Second new cartoon will be posted in the morning. This entry was posted on Wednesday, June 27th, 2012 at 10:13 pm	and tagged with mistakes and posted in cartoon. You can follow any responses to this entry through the RSS 2.0 feed.